In the Apostles’ Creed we profess that Christ “descended into Hell.” Another priest recently asked me to justify that tenet of the Apostles’ Creed according to Scripture. He said, “I know that it pre-dates the Great Schism and that it is not an East versus West issue, but if I can’t find it in Scripture, then I can’t teach on it.” Thankfully, the doctrine can be found in scripture. 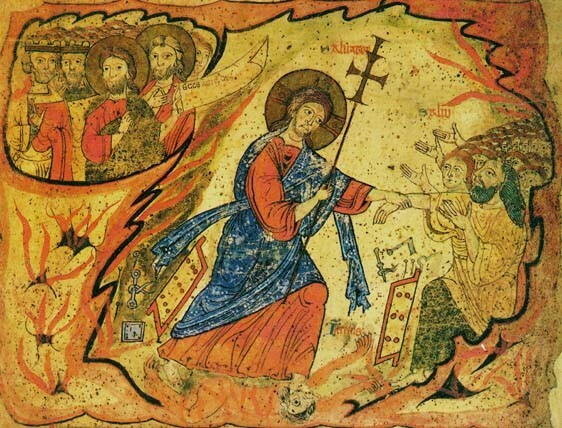 For those unfamiliar, the Harrowing of Hell is an ancient tradition wherein, in the interim between Good Friday afternoon and Easter morning, Our Lord stormed the Gates of Hell and released those who had been there but were destined for Heaven. Since salvation can only come through Christ Jesus, prior to His Incarnation none could have achieved salvation and found their eternal home in Heaven. Upon Christ’s death, He was able to go into Hell and release those who had been waiting for His advent. Abraham’s Bosom was a place which reflected rest and comfort as a child climbing upon their father’s lap when they were weary. Since, of course, Abraham was the father of all of the Jews, any Jew resting in the Bosom of Abraham would be resting on their father’s lap. We see this idea in the New Testament in St. Luke’s Gospel when Our Lord tells the parable of the Rich Man and Lazarus. (16:19:31) Clearly, when Lazarus dies he is resting peacefully in the comfort of his Father Abraham, whereas the Rich Man is suffering in the “place of torment.” Thus, while the Patriarchs and Prophets would have been in Sheol, which is sometimes translated as Hell, it is not right to think of them roasting in a lake of fire. Thus, perhaps it is inappropriate to imagine Christ, “kicking in the Gates” and overthrowing demons and devils with a mighty swords and moves that would put Chuck Norris and Bruce Lee both to shame, but Holy Scripture is clear about this. After His death, Our Lord “went and preached to the spirits in prison, who formerly were disobedient.” The dead heard the Voice of God, and those who did hear lived as Our Lord took hostages out of Hell and “led captivity captive,” taking those who were prisoners into the paradise of eternal life in Heaven. This is an example of a story which is better known in its many visual depictions throughout the medieval churches of Europe than in any written form. The Biblical basis for the story is scanty at best. The descent of Jesus into the underworld does forms part of the ancient Apostles’ Creed, where Jesus is said to have “gone down to those beneath” (Latin, descendit ad ínferos). And, there is a Biblical echo of this statement in Ephesians 4:9: “he descended into the lower parts of the earth” (Latin Vulgate, descendit in inferiores partes terrae). The Latin adjective inferus simply means “lower, below, underneath,” as you can see in the English word “inferior.” Yet in ancient Roman culture, the “underneath world” was widely considered the abode of the dead, so that the plural form of the adjective, inferi, often stood simply for “the dead.” In English, this same Latin root even gives us the word “inferno,” which has lost its sense of “below,” and instead now refers to any kind of terrible “fire,” not limited to the fires of hell thanks to Dante. 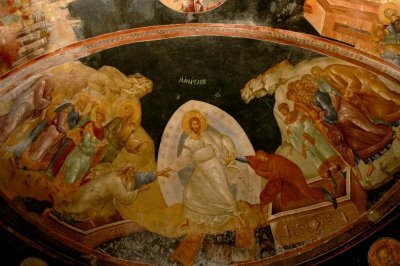 The fullest written account of the “Harrowing of Hell” is not found in the Bible, however, but in the non-canonical Gospel of Nicodemus, a text which probably dates back in some form to around the 3rd century. Here is where we read how Jesus, after his crucifixion, descended into hell and brought salvation to the souls of the dead who were prisoners there. The story begins with a dialogue between Hades and Satan, who have heard word that Jesus is coming, which prompts a debate about the power of Jesus. Hades is afraid, because he has heard of the miracles Jesus has performed on earth. Satan, on the other hand, has heard that Jesus was crucified as a common criminal; he is certain that they will be able to bind and subdue Jesus when he arrives in their realm. When Jesus arrives, Hades bids his servants to bolt and lock the doors, but to no avail; Jesus shatters the gates and enters. He seizes Satan and binds him in iron chains, then consigning him into Hades’s keeping until the second coming. Jesus next turns his attention to the patriarchs. He raises up Adam, along with all the prophets and the saints. Together, they all depart up out of Hades, and ascend into Paradise. The “Harrowing of Hell” portion of that Gospel was widely circulated in other compilations of religious literature, most notably in the Golden Legend of the lives of the saints, compiled by Jacob of Voragine in the 13th century. The Bible verses you mention, really do little more than hint at this story. It could not be formed from those verses alone. So, although this is a not a story about Jesus that you will read about in the Bible, it is nevertheless a very famous tradition, as told both in words and, in images to the church. I disagree with you on number of details. I agree that artwork has largely formed the images of the Harrowing, but I disagree that medieval or European. The clearest images of the Harrowing, though they are not known by that phrase, comes from orthodox icons from the Eastern church. Nevertheless, simply because a Biblical event is “mis-portrayed” in art, does not mean the event did not happen; it merely opens the possibility that it did not happen in the way it was depicted. The famous Renaissance paintings of St. Thomas sticking his hands in Jesus’ side or St. Paul falling off of a donkey on the road to Damascus do not invalidate those stories in the Bible. Scripture never says St. Thomas did not stick his fingers in Our Lord’s side; it focuses rather on the saint’s proclamation rather than any action. While “Infernum” does have some ambiguities, it clearly refers to a place of the dead. It may not have been a fiery lake in other ANE parallels, nor a detailed depiction that like Dante envisioned, but the line clearly is not saying Our Lord went “DOWN town” or “DOWN South.” The Lower Places meant the place where the dead abide. Additionally, Our Lord’s inclusion of “Abraham’s Bosom” in His parable testifies to the authenticity of that concept. Now, I will grant you that there is not Biblical foundation for Jesus kicking down gates, or riding a horse through Hell, or even lifting the doors off of vaults, but that doesn’t mean that the concept is flawed. It means later artistic presentations are possibly inaccurate. 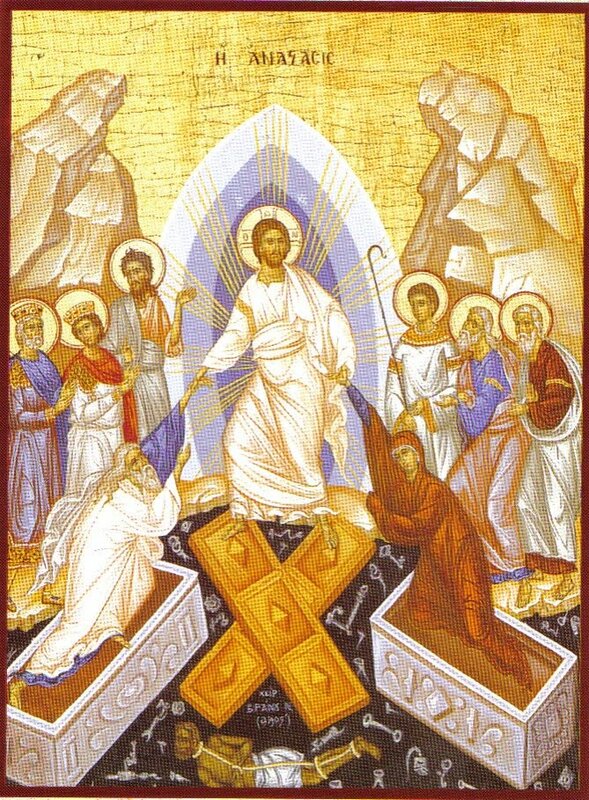 Thus, it may or may not have happened according to orthodox iconic presentations, but He did preach to the dead and He did lead those who accepted what they heard into Heaven. As I said in the Facebook thread, the Harrowing was probably far more like the Emmaus Road Conversation than anything quite as theatrical as later artistic representations.